Santa can wait, Trine is more important. Developer Frozenbyte is hoping to release the PS4 version of Trine 3: The Artifacts of Power before Christmas, complete with all the visual bells and whistles from the PC version. Oh yeah, and co-op for three players! The third game in the puzzle platforming Trine series received a major overhaul, turning a once 2D game into a gorgeous 2.5D experience. 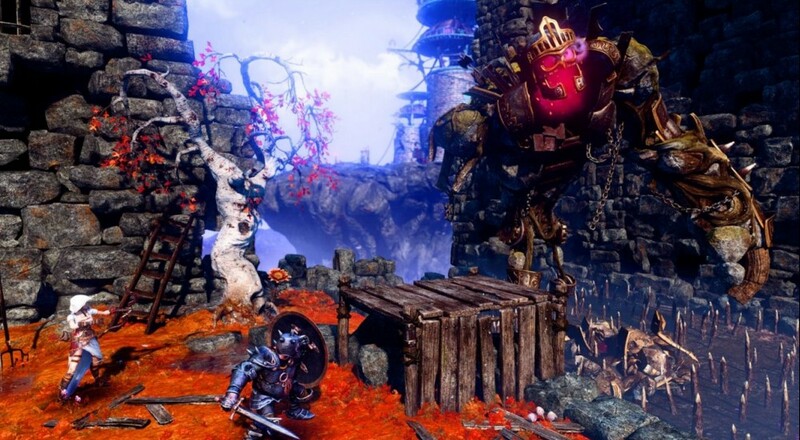 Players weren't sure about the change and have had plenty of words to share about Trine 3 since its PC launch, even though the core gameplay has remained largely the same. Players take control of one of three characters, each with unique abilities that help them traverse the puzzle and enemy ridden landscape. The Wizard can conjure boxes and levitate foes, the Knight can stab things with his stabby stabber, and the Thief has a bow and grappling hook used for exactly the things you think they'd be used for. By switching characters or inviting enough friends, you can work your way through the gorgeous world one puzzle at a time. One thing definitely hasn't changed a bit in the new game: how awesome Trine is with co-op. Local couch play supports up to three players in the PS4 version, one person as each of the main characters. No online like in the PC version, but whatever, that's cool. The console release does keep full HD 1080p with 60 FPS visuals, which will make the already stunning game look even stunningier. Page created in 0.4085 seconds.